What is your outlook for a market rebound by 2011? "When you are in situations like these, don't plan too long in advance because you may regret it." CEO Carlos Ghosn has put Nissan Motor Co. back on track to return to an operating profit in the fiscal year that ends March 31, following a big loss in 2008. Now his focus is the future. Nissan will start selling its Leaf electric vehicle in 2010, with plans to market it worldwide in 2012. The company is investing billions in the gambit, and Ghosn is stumping hard to convince consumers that the era of battery-powered cars has dawned. 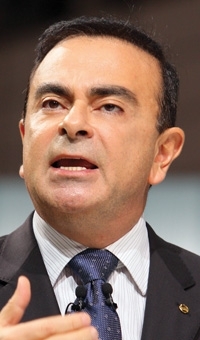 Ghosn, 55, spoke with Editor Jason Stein and Asia Editor Hans Greimel about his outlook, the impact of exchange rate fluctuations, his plans for electric vehicles and his thoughts on adding a third partner to the Nissan-Renault alliance. Where will the U.S. market end in 2009, and what does 2010 look like? We'll probably end up at the level we forecast at the beginning of the year, which is somewhere between 9.5 million and 10 million cars. We think 2010 should be a little bit better, which means something between 10 million and 11 million cars. Many forecasts call for momentum to pick up in 2011. Is that your outlook as well? For me there are two possible scenarios. One scenario is of moderate growth in 2010 continuing in 2011. And it is going to take a very long time for the market to recover to anything around 14 or 15 million cars. It's the most prudent one. And then we have another scenario that is more positive: 2010 is going to see moderate growth, and then in 2011 we'll have a lot of momentum. It's a refreshing scenario. But I don't see too much beef behind it. The yen has surged against the dollar in recent months. How is that affecting operations? It's not so much the strength of the yen. It's the volatility. All of a sudden you're moving from an average of 110 yen to the dollar to 90 yen to the dollar. And you do it in a very short period of time. This kind of volatility we don't like because you can't prepare for it. The first consequence is that Japanese makers are -- I would not say losing market share, but they are holding market share in many export countries where they used to be gaining it. The second consequence, even though not a lot of carmakers are talking about it, is a lot of work is being shifted from yen-cost base to dollar-cost base. This is something we do not like because this is where our strength is. It's in Japan. And shifting work from Japan is not something Japanese carmakers will do wholeheartedly. But we are forced to do it because we can't compete unless we adapt our cost base to what the world market wants. Does that mean you will be moving more Japanese operations to North America? Without any doubt our plants in Mexico will be fully used. The sourcing in Mexico is going to increase. And the capacity in the United States is going to be much more used than in the past -- not only for the U.S. market but even for exports. That's a consequence of what's happening today. We're going to have more cars for the United States built in the United States or in Mexico; and if we still have capacity, we're going to export. Nissan has trailed rivals in hybrid vehicles. What is your hybrid strategy? Here we're following the market. We are not intending to play a leadership role in hybrids. Anyway, it's already taken. One company has already assumed leadership. We want leadership on EVs. That's what we are pursuing. It's not a question of being the first one. Nobody cares about who was the first one. The first one to build an electric car was 100 years ago. What's going to be important is mass marketing it, and who's going to be in control of all the core technologies leading to it. What is the biggest challenge in launching the Leaf electric vehicle? The biggest challenge in launching the Leaf so far is making sure we're on time. Making sure that the battery is on time, that we will have the capacity on time, that we're going to be really serving the market in a way where people are not waiting too long. Some people imagine that an electric car is like a golf cart. But it's not. It's a real car. ... And I think it will have a big impact on young people. What percentage of U.S. sales will be electric vehicles by 2015? I think the U.S. will move very quickly, for strategic reasons, which means the government will support it. The U.S. is a net importer of oil, and the transportation sector runs on oil. We've got find a solution to this. And the only solution today is electric or fuel cell. What are your latest thoughts about adding a partner to the Nissan-Renault alliance? Strategically, it makes a lot of sense for us. We'll never change our opinion on this. I don't think now is the time to do anything because we need to ramp up our business, and that is what we are doing: bring our company back to profit, make sure that finances are under control. After this, we'll continue to take a look. It's not something that's urgent; it's not something that is mandatory. If it makes sense, we'll do it. If it doesn't make sense, we won't. The alliance works well. We've been working for 10 years. The only thing I'm hearing about the alliance is that you can get more synergies. We are really very solid. By attracting other makers into this kind of arrangement, we are going to continue to increase the benefits of the alliance in terms of scale, sharing technologies, sharing powertrains, sharing parts, sharing strategies, while keeping different identities. By the way, we couldn't have done the electric car without the alliance. Can you talk about Saturn's approach to have Renault supply it with vehicles to rebadge and sell in the United States? Why was the deal rejected? Frankly, you go into a deal like this only if it makes sense economically. For Renault, it didn't make sense economically. We think Saturn is a good brand and the dealers are good dealers and Roger Penske is a remarkable businessman. But, at the end of the day, if you do something like this you have to say: What's in it for me? And if what's in it for you is very small, with big risk and small opportunity, you don't want to do it. How much longer do you think you can wear two hats as the CEO of Nissan and Renault? I'm wearing two hats as CEO, but we have reorganized. I have a COO at Renault and a COO at Nissan, which reduces a little bit of the day-to-day pressure of being with two businesses that are in situations of crisis. You are making India a low-cost export base to Europe. How long will it be before we see a major global automaker using India as an export base to the United States? I would not do it personally because you should source and sell in the same currency. If you need capacity for the United States and you want a low-cost country, go to Mexico. What models don't you have in the United States that you wish you had? I think we have to be careful in the United States not to abandon the segment of very cheap product to other carmakers. So this is where we will be introducing entry-price-point products in the future. Those are the cars selling at or below $10,000.